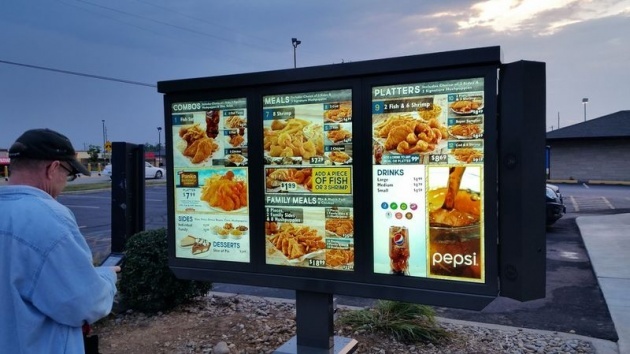 With more than half of its business funneling in through the drive-thru, Long John Silver's brand revitalization program made this channel a top priority, culminating in new outdoor menu boards designed to knock drivers' socks right off the floorboards. The roll-up interactive drive-through menu boards fill drivers' vision with three 55-inch, high-def video screens and built-in high-def audio. The result? Optimum customer interaction and brand engagement without ever setting footing inside the restaurant itself. "We have seen a noticeable increase in food and beverage sales since the installation of the new menu boards," Long John Silver's Senior Manager of Merchandising and Menu Boards Chris Fuller, said. The menu board platform, provided by Allure, a division of Christie Digital Systems USA, enables digital order confirmation and full-color, high-resolution animation, video and graphics. The system allows for updates of menus and promotions. Promoted specials can be linked to historical sales trends, special events and local weather forecasts. The menu board also allows the restaurant to highlight certain items at certain times of the day. "On the fly, you can hang calorie counts, you can add or subtract pricing, or change pricing to specific menu items," said Chris Northrup, vice president of digital media and network strategies for USSI, which handles the installation for the project. "All that's done with a couple of key swipes." This is more efficient and effective than having an employee change information manually.